Team members in the Run to Fight Children’s Cancer carry flags and wear special T-shirts to show their togetherness. 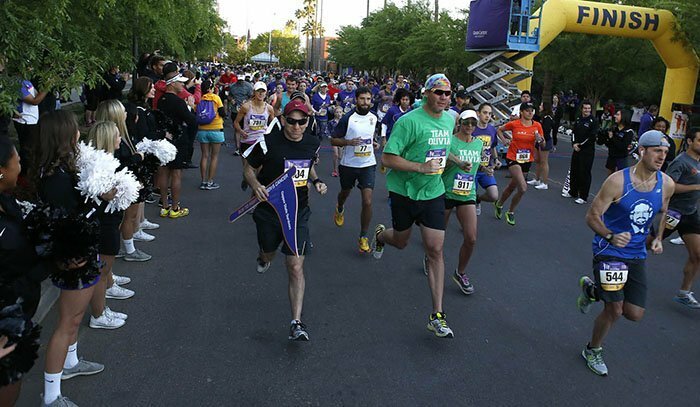 The Grand Canyon University Foundation’s Run to Fight Children’s Cancer is a team sport. Last year, more than 100 teams crossed the finish line, led by the largest ever – the 127 members of Jace’s Defenders. A similar number is expected again Saturday, including a return of the mighty Defenders, led by this year’s race starter, Jace Hyduchak. Each team shows up on race day with its own backstory, its own brand of team spirit. Here are profiles of three of those teams. Together, they offer a glimpse at the groundswell of commitment from all those who run the race. To aid in bringing attention to this cause and help spotlight the children battling the disease and the families tirelessly supporting them day in and day out. We believe that the more support these families receive, the more energy they have to be that rock their little ones can stand on to conquer all the challenges they are facing. How did you come up with your team name? Who’s the team member most likely to bring up the rear and why? Randy Blackwell. Because that is just tradition with Randy and this race. We have some great finish-line footage of his spectacular finishes, which at times have involved dry heaving. Do you have team shirts or uniforms? No, we like to wear the Run to Fight shirts to help drown the GCU campus in a sea of purple in support of all these brave little warriors. Cancer survivors are the superheroes of Run to Fight. Who is your team superhero? Butch Glispie, owner of Pono Construction in Phoenix, is for sure our superhero. He is the driving force behind all we do here and the glue that holds our team together. Butch’s drive, perseverance and loyalty to his team inspire the same commitment in return. Pono is family, and without the contribution of each member we would not be able to accomplish such great things each year. Since covering my first Run to Fight for GCU Today in 2013, it has been the most gratifying, the most inspirational and the most important thing to me at GCU. Cancer is bad for adults, but it is especially devastating in children because as the late cancer researcher Dr. Robert Arceci told me, it “cuts people short.” It’s a thief that robs these babies of so much. A year ago in February, I was diagnosed with leukemia, which happens to be the most prevalent pediatric cancer. I underwent several rounds of chemotherapy and a bone marrow transplant during four stays in the hospital that totaled nearly 80 days. It was rough, and the takeaway for me was I can’t fathom how these little ones, not understanding what is happening to them, endure the frequent needle pokes, the medicine that keeps them alive but makes them so sick, the loneliness of a hospital room, the inability to go outside and play. And their parents — how on earth do they cope? I missed the 2016 Run to Fight, but now that I am feeling better, there was no question we would assemble a team to be there this year. And that’s because these tiny survivors and their families deserve more attention to be called to them, more education to be available and, especially, more money to be raised for the diagnosis and treatment of all pediatric cancers and, please God, the cures. The phrase is advice from the first hematologist I met at Mayo Clinic and from Patti Luttrell, founder of Children’s Cancer Network, one of the Run to Fight beneficiaries, and the soldiering mother of Jeff. Patti’s boy was diagnosed with leukemia at 5 and today, at 27, is still battling cancer. Those five little words helped us get through my diagnosis and treatment and are front and center in my continued recovery. Oh, that would be me. I want to see Jack and my incredible friends step over the line. I hope I remember to bring my hanky. We have Team One Day at a Time buttons, yellow (for pediatric cancer) and orange (for leukemia). Our team has no dress code, which is a good thing because I will be wearing garish Wonder Woman knee socks that a friend from Ohio sent. Each has a sparkly red cape on the back. But really, the grace and healing power of God are why I’m still standing — and walking! — today. What are your reasons for running? We have been running in the race for three years. When we started the run, we participated because cancer is a worthy cause. We have several people in the department affected by cancer one way or another. One of our officers a few years ago lost his young daughter to cancer, and since then we have made it a priority to have a team in the event. How did you come up with your team name? Debbie Accomazzo, the race director, assisted us. Who’s the team member most likely to bring up the rear and why? I’m not sure who will be bringing up the rear, but probably it will be Officer Kevin Jones. Do you have team shirts or uniforms? This year we will be wearing white. Officer Arnold Washington and his son Derick Washington, a 25-year-old cancer survivor. Derick was 5 when he was diagnosed with pancreatic cancer. Like other children battling cancer, he endured long hospital stays, grueling treatments and fear. His family was his rock. “Derick, like all kids who battle cancer, are superheroes,” Arnold said. As someone whose child was diagnosed with an aggressive form of cancer three times, this makes my heart glad. She was 16 when she was first diagnosed with Stage 1. Within two years, she was diagnosed twice more with Stage 4. She is now 21 and cancer free. God bless those who choose this cause to help eradicate childhood cancer. Cancer does not just affect the patient, but their family and friends. Our lives are forever changed. Her name is Leah. She is a fighter and survivor. But more than that, she is my blessing. Great article, Karen, and I’m so glad you’ve documented this incredible event. Loved seeing you at lunch today! !